An unconfirmed report said three three Naval personnel-an officer and two ratings- as well as six civilians lost their lives. The Guardian gathered that MEND used dynamite in the operation which also left Naval offices shattered and windows smashed. It was also learnt that the incident which occurred at about 8.00 p.m. affected the main manifold of the Atlas Cove jetty gantry used for offloading of imported petroleum products as well as vessel onsite. The militants were said to have come in three speed boats and after about an hour gun battle, they wreaked the havoc on the oil receptor facilities as well as the Naval office at Lagos Naval dockyard. A statement by MEND's spokesman, Jomo Gbomo, said: "A boardroom or creek battle of epic proportion which will either emancipate the Niger Delta from over 50 years of tyranny or subject her to perpetual slavery was flagged off tonight by Hurricane Moses with a plague of warning attacks. "Led by a pillar of fire, heavily armed MEND fighters today, Sunday, July 12, 2009 at about 2230 Hrs carried out an unprecedented attack on the Atlas Cove Jetty in Lagos State. The depot and loading tankers moored at the facility are currently on fire. "The two-pronged approach of combining dialogue and intensifying attacks throughout the course of negotiations, will be the unique characteristics of Moses. "The Aaron team that will be put together after due consultations with stake holders from around the globe, militant commanders and Henry Okah, will present the time framed demands of the Niger Delta region to the President through the Timi Alaibe-led Federal Government of Nigeria delegation. "MEND will as usual update the public on the progress being made as well as plagues being delivered. "The mother of all plagues will be used as a last resort if the Nigerian Pharaohs show stubbornness over reasoning just as Moses did with the plague on the firstborn in ancient Egypt and the Americans with the plague of the atomic bomb in Hiroshima and Nagasaki. "We sincerely hope for the sake of avoiding a total calamity that Egypt will not harden its heart and the exodus of our people to the promised land can commence as soon as possible. "God save Nigeria. God bless the Niger Delta. God bless our Freedom Fighters." 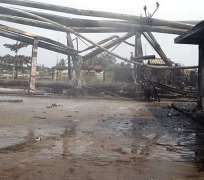 Nigerian National Petroleum Corporation (NNPC) officials who visited the scene of the incident yesterday morning told The Guardian that oil operations have been suspended at the Atlas Cove Jetty/Depot as activities for receiving petroleum products have been shifted to Apapa depot. "We cannot pump fuel to our other depot now; it is also not possible to receive fuel through Atlas Cove jetty because of destruction to the main mani-fold... we have directed other import vessels to Apapa jetty," an NNPC source said. The Guardian learnt that one of the security men at the jetty is missing. The NNPC official who spoke on the basis of anonymity said a vessel was discharging fuel into the Atlas Cove Depot when the incident occurred. Speaking with reporters at the scene yesterday, the NNPC's Group Managing Director, Dr. Mohammed Sanusi Barkindo, said that it was unfortunate that militant groups have shifted their activities to the onshore sector of the nation's petroleum industry. He explained that the attack on the NNPC facility would not stall the distribution of petroleum products nationwide, assuring that the corporation has enough stock of products. He said that this was the first time in the history of Atlas Cove that an attack of such a magnitude occurred. He said that the workers of the corporation were moved to Bonny Camp for safety. His words: "Last night at about 11.50 pm, we were contacted in Calabar, where we have converged with our management staff in the management's retreat on the way forward with the industry reforms. And shortly after dinner, we got an alarm call from our colleagues here in Atlas Cove that some unfortunate incident was going on at that time. And of course, we immediately began to get in touch with authorities including the Chief of Naval Staff, the NPA, Lagos State Government and other agencies for them to arrange for a rapid response, first of all, to save lives of our staff who are on duty and other military personnel particularly the Navy, and the security of this facility which is more or less one of the key sources of supply and distribution of petroleum products in the country. "Reports reaching us up to the wee hours of this morning were that the staff of NNPC who were on duty were safely evacuated to Bonny Camp Military Mess. No live was lost; we thank God for that. And the fire itself at the facility was finally put off around 4:10 am. "Fellow comrades and countrymen, as far as we are concerned, this is the first time that this type of incident has happened in Atlas Cove and its environment. Therefore, literally, almost everybody concerned was taken by a big surprise, because this facility has been secured on 24 hours basis, seven days a week, we have never had any incident. We have had excellent relations with the surrounding community here who have been extremely helpful to us as a corporation. But it is unfortunate that this incident has happened. I therefore would like to use this opportunity to condole (with) our Chief of Naval Staff for the loss of his gallant personnel." In his own remarks, the Chief of Naval Staff, Ishaya Ibrahim, said that the attack was a surprise to him, pledging that security at the jetty would be strengthened to protect the facility. He noted that the oil and gas sector was the economic energy of the nation, stressing that the militants should graciously receive the amnesty offered to them by President Umaru Musa Yar'Adua. Ibrahim, however, said the Navy lost two men. The leader of Julius Berger Nigeria Plc Vessel team that put out the fire yesterday, Captain Geofrey Boukoru, told The Guardian that five burnt bodies were found at the scene. He explained that the attackers may have over-powered the securitymen at the depot and gained access to the place adding that his team were able to control the fire. The captain said his men arrived at the scene at 10pm about two hours after the attack. Also commenting after assessing the damage yesterday, the Executive Secretary, Major Marketers Association of Nigeria (MOMAN), Mr.Obafemi Lawore, described the development has several implications for the petroleum downstream activities and the economy as a whole. According to him, with this attack getting foreign vessel to bring fuel imported by either the Nigerian National Petroleum Corporation (NNPC) and MOMAN will be difficult adding that this may also affect adequate fuel supply to domestic markets saying he would not be surprise if Nigeria would not go through lingering scarcity before the situation is stabilised. Lawore disclosed that MOMAN will seek a meeting of key stakeholders in fuel distribution including NNPC,depot owners and the government to design measures aimed at safe guarding oil/depot facilities in Apapa area of Lagos. Also speaking yesterday,Managing Director and Chief Executive of Capital Oil and Gas company limited Mr.Ifeanyi Patrick Ubah said the development does not augur well for private depot owners operation in the area. Ubah said there will be urgent need for the private depot owners and other stakeholders to meet and adopt security measures to check unforseen incidents around their depots or oil facilities. Atlas Cove located on Takwa Bay area of Lagos hosts the foremost oil receptor and depot for all imported fuel into the country as well as products from the refineries meant for South West market including parts of North Central of the country. The Atlas Cove jetty is the hub of NNPC distribution network tagged system 2E which supplies products through pipeline network to NNPC's depots in Ejigbo, Mosimi in Ogun , Ibadan in Oyo State and Ilorin in Kwara State.The 2E distribution network also connects Ore depot in Ondo State. "We are aware of the attack on the Atlas Cove Jetty but the details are still sketchy. But we must say that the MEND has exaggerated in its statement," a naval spokesman, Captain Henry Babalola, told AFP. "We have heard of the attack but we are trying to get facts surrounding it," Lagos State police spokesman, Frank Mba was quoted to have said. The violence has forced Royal Dutch Shell, U.S. oil company Chevron and Italy's Agip to shut in crude oil production estimated at over 1.3million barrels per day. Within Shell operations alone,MEND attacked the EA field in February 2006 which has capacity for 115,000 barrels per day. In June 2008 Bonga offshore facility was attacked ,the Offshore vessel has capacity for 225,000 barrels production and can store two million barrels of oil. Other attacks on Shell operations include Utorogu-Ups trunk line in January 2009,Amukpe-Rapele manifold also in January,Trans-Escravos-Forcados River manifold in February,Trans-Forcados Pipeline(Chanomi Creek) manifold and Trans Ramos Pipeline both in June 2009. Chevron and Agip have also had their own share of the attacks. President Umaru Yar'Adua has offered a 60-day amnesty programme to militants and criminals in hope of restoring peace to the region.